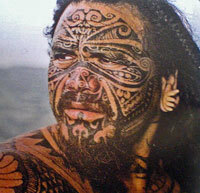 The History of Tattoo...or "Tatau"
"What? I love my mom!" The History of Tattoo is a surprisingly long one...in fact, we humans (well, some of us) have been marking our bodies with tattoos since the Neolithic Age more than 5,000 years ago. It may be that before your tattoo idea is fully formed, you might find that understanding this "colorful" past can be useful in making your own decisions. The oldest found so far dates back to at least 3,300 B.C. (some estimates are older) with the discovery of the frozen remains of the so-called “Ice Man” in the Austrian-Italian border region of the Alps. To the amazement of scientists who carefully studied the mummified corpse, as many as 57 individual and sometimes intricate tattoos were found on the well-preserved skin. Many others have been found on mummified remains and can be seen in paintings and engravings found on ruins and artifacts from the ancient world. By 2,000 B.C. the practice had spread to the far-flung corners of the known world; from Europe to North Africa and Southeast Asia. Clay figurines found in ancient Japanese tombs - some dating back to the second and third millennium B.C. - were adorned with paint and engravings on their faces and bodies that likely represented tattoo designs. Largely overlooked by the early historians and archaeologists, tattoos adorned the bodies of some ancient Egyptians. In 1891, the mummified remains of a tattooed priestess who lived around 2,000 B.C. were unearthed at Thebes. With Egypt's sea trade developing in the ensuing years, the art of tattooing reached further still into the Middle East and along the Mediterranean. For the later Greeks and Romans, tattoos (then called "stigmata") were apparently used as a means to mark someone as "belonging" to a particular religious sect or to an owner (in the case of slaves). Back then, before your tattoo was even healed, you would have been the subject of some serious Greco-Roman profiling. Yes, the history of tattoo carries a history of bias and scorn right along with its record of invoking wonderment and envy. Later still, Roman soldiers began sporting tattoos, and this practice eventually spread across the Roman Empire until the emergence of Christianity, when tattoos were banned by the suddenly converted Christian Emperor Constantine (A.D. 306-373), as he claimed that tattoos "disfigure that (which was) made in God's image." Way to wreck everyone's fun, pal! 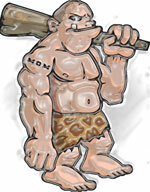 Meanwhile, ancient Britons (still pagan at that time) were tattooed as a mark of high status. With "diverse shapes of beasts" tattooed on their bodies, the Romans named one northern tribe "Picti" which meant "the painted people." For the most part, the “civilized world” of the Christian Era remained aloof and largely ignorant of any history of tattoo or its practice, until European explorers discovered the natives of the Americas and then the Pacific islanders. During his expedition to the South Pacific in 1789, Captain James Cook first logged the Polynesian word “tatau” (sometimes rendered as "tattau") when he came upon the decorated people of the islands. "But why did they do it?" Even though today's much-improved instruments and procedures still deliver a measure of tattoo pain, the various methods employed in the past (especially those practiced by the more primitive peoples) could be truly agonizing...with frequent instances of unintentional infection, maiming and even death. "What does the History of Tattoo tell us?" Regardless of the reason, tattoos have been with us for a very long time...so at the very least, you can feel like you are a part of a VERY long and "colorful" (pardon the pun) tradition. In other words, YOU will be a PART OF THE HISTORY OF TATTOO! Pretty cool, right? 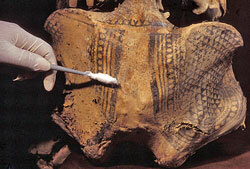 For more on this, check out the Smithsonian Institutes page: Tattoos - The Ancient and Mysterious History.